Fritz Lang's noir take on vengeance and institutional corruption in the postwar American suburbs is a gold-plated classic. THE BIG HEAT is a thrill to discover and a joy to re-visit, as clydefro is reminded via Indicator's dual format release. People remember the coffee. 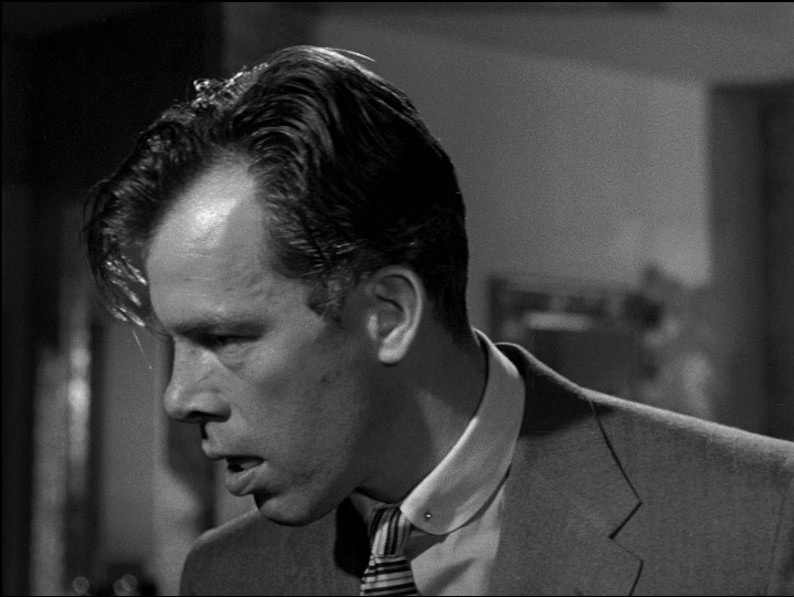 To be more precise, it's the steaming pot of java Lee Marvin douses Gloria Grahame with in Fritz Lang's The Big Heat that tends to draw viewers' attention to this 1953 film noir. But that's an hour into the picture. As shocking as it is – and, make no mistake, the years or the watches never dull the brutality of scalding a beautiful young woman's face – the scene is hardly an outlier in a film that opens with a man picking up a handgun and slumping lifelessly after shooting himself in the head. In his best film of the decade, Lang puts cynical, raw violence on the screen without apology, and he does it as his protagonist becomes increasingly unhinged by the entire concept of crime. Lang spent much of his career dissecting the ins and outs of the criminal enterprise. His German filmmaking years and his time in Hollywood don't always overlap thematically but the fascination with crime was something of a constant. From the Mabuse movies to Spione and M, Lang favored exploring the individual effects of various crimes in several of his more popular features made while still in Germany. His Hollywood years were bookended by Fury and Beyond a Reasonable Doubt. The former is a rebel yell at mob mentality in which Spencer Tracy faces a lynch mob looking to be judge, jury and executioner all at once while the latter is easily among the great inquiries on the American criminal justice system of the time, a film that sees Dana Andrews intentionally frame himself for murder. The in-betweens are numerous and overwhelming. Paranoia almost inevitably seeps in if at all possible, making Lang something of a precursor to those classic '70s films made by the likes of Pakula, Coppola and Pollack. That saying of it not being paranoia if it's real applies to The Big Heat. The film's lead character Dave Bannion (Glenn Ford) is a police sergeant whose life unravels as a result of his generic, suburban town being controlled by criminals. The opening suicide weaves its way onto Bannion's radar when the victim's mistress is brutally murdered after meeting with him. Mobster Mike Lagana (Alexander Scourby) pulls the strings amid his life of luxury, and his enforcer thug Vince Stone (Marvin) entertains the police commissioner and other town luminaries during card games. It's a fortuitous set-up for the bad guys but a cynical nightmare for proverbial do-gooders like Bannion. The turning point comes midway through the picture when, after lovely establishing scenes showing the policeman at home with his wife (Jocelyn Brando) and young daughter, Bannion's life is upended. He will seek vengeance at all costs, even throwing down his badge at the corrupt commissioner. Some critics have identified Bannion as something of an angel of death since those he comes into contact with in the picture have a tendency to be killed soon after he leaves them. Owing to recklessness or mere coincidence, it's certainly true that death tends to follow our lead character. He carries an enormous burden early on of challenging the powers that be regarding the reasons behind the opening suicide. It would have been so much easier to conform and accept the widow's claim that the victim – a fellow cop – had been dealing with health issues. But a tip brings Bannion to Lucy Chapman, a former mistress of the dead man. The can of worms is thus opened, and how does one not respect our protagonist as someone determined to stave off corruption in a place brimming with it? His entire arc is fascinating for how seemingly benign and predictable it begins only to quickly pivot into the vengeful, believably dangerous direction it takes. A cop abandons his badge because he somehow thinks he'll be more effective acting as a lone wolf. Bannion's evolution, so to speak, gave Glenn Ford a grand opportunity to show his range. The actor was adept at playing decent, principled men but also could be entirely believable as menacing. The Big Heat lets Ford straddle the line. His focus is simultaneously his best and worst attribute. While he's unrelenting in the quest to find those responsible for what happened to his wife, Bannion also seems so blinded by his rage as to carelessly put others in harm's way, hence the collateral damage. Ford imbues the character with a crooked smile. Even as he's relentlessly stalking the goons and boss attached to her boyfriend, Bannion develops an almost tender relationship with Grahame's Debby that's brimming with a rough kind of empathy. 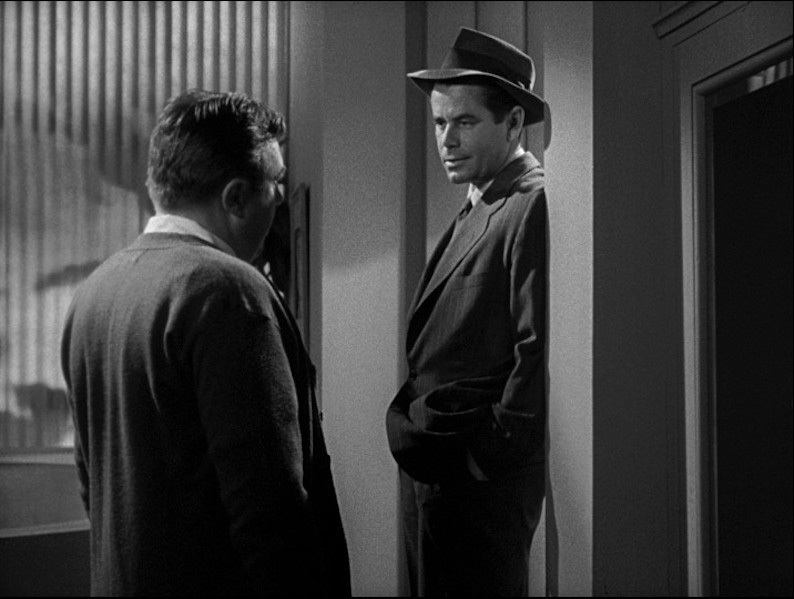 Ford and Grahame had chemistry – expanded upon by Lang in the following year's Human Desire – but the way their two characters interact is unusual, particularly in the world of film noir. Rather than Debby acting as a by-the-numbers femme fatale, she's sharp-tongued and clear-eyed. In some ways she actually transforms into the lead figure in the third act. Grahame brings her to vivid life, prancing around in a white party dress probably paid for by a man she loathes yet someone who keeps her well-dressed, hydrated and in furs. Near the end Grahame's character tells the widow that they're "sisters under the mink," a great line in Sydney Boehm's screenplay (based on a serialized novel by William P. McGivern). The potential lack of sincerity doesn't put a damper on the accuracy of the statement or its insight into the film's repeated theme of duality. Dressed in nearly identical coats, the two women both have benefited from the corruption and gangsterism that has infected this suburban wasteland, and both have now lost the fight to continue such a lifestyle. The difference, of course, is that Debby has found redemption after pairing with Bannion. She's the key figure of The Big Heat. 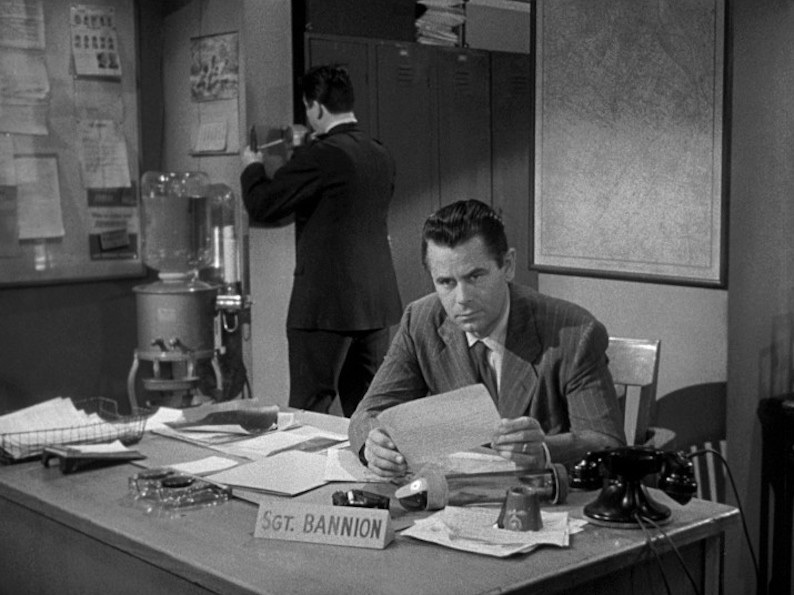 While Lang lets Bannion play psycho and vigilante he ends up right behind the same desk where he began - haunted but back to his post. Debby's fate is much different, far more poignant. She essentially does Bannion's dirty work and comes out the other side as the film's cathartic center. Powerhouse's Indicator series adorns The Big Heat with spine number 016 in a Dual Format Edition limited to 5,000 copies. The region-free release has gorgeous cover art inspired by vintage poster designs and also contains a 36-page booklet alongside the Blu-ray and DVD discs inside the case. The image is presented in the 1.33:1 aspect ratio in what is billed as a high definition remaster. The Big Heat has never been on Blu-ray before in the UK but it's been issued twice by Twilight Time in the United States as well as a few earlier DVD editions. There was also a Wild Side release in France on BD. It's never looked particularly bad or poor, indicating that the original materials must be in fine shape. Every new release has generally been something of an improvement, and that continues here with the Indicator iteration. It ups the bitrate over Twilight Time. Speckles and debris I remember from earlier DVD editions are absent here. The contrast, too, looks silvery and bright while retaining sufficiently deep black levels. Detail impresses and adds to the overall opinion that this should make a most pleasing viewing experience. Clean and pleasing to the ear, the English language LPCM Mono Audio hits its marks without incident. Dialogue and the musical score are clearly heard. The expectedly modest depth that goes along with an original mono track is hardly cause for concern. Aside from the isolated score, this is the only audio option and it's a fine one. Subtitles are optional, in English for the hearing impaired. The audio commentary by Julie Kirgo, Lem Dobbs and Nick Redman is borrowed from last year's Twilight Time encore edition release. This track is mostly Kirgo and Dobbs with the latter using actual perspective and film history to offset the former's intense and frequent criticism of Glenn Ford's character despite a generally unexplored opinion that this is Fritz Lang's best film. It's dinner party conversation of the sort that some may judge harsher than others. The lengthy Tony Rayns on Fritz Lang and The Big Heat (33:21) is some degree better. UK critic Rayns discusses the film and its director in a good, wide-ranging piece. A couple of interviews that originally appeared on Sony's 2009 noir collection DVD set reappear here. Martin Scorsese on The Big Heat (5:48) lets the director talk a little about, among other things, the famous coffee scene and the overall look of the film. Michael Mann on The Big Heat (10:57) has the filmmaker speak briefly on how he was influenced by the picture, its place in film noir and the unusual way it portrays women. A re-release Theatrical Trailer (1:43) has been included. An Isolated Score option allows Henry Vars' original music to be played on a track absent dialogue and other sounds. The Image Gallery collects on-set and publicity photography as well as a nice array of posters, 38 images in total. Lastly, the 36-page Booklet begins with a new essay by Glenn Kenny that runs for half a dozen pages of text. A three-page extract from a Peter Bogdanovich book featuring Fritz Lang discussing The Big Heat follows. There's then eleven pages of excerpted reviews for the film, from authors as varied as Lindsay Anderson to Manny Farber to Francois Truffaut to Lotte Eisner. Some information on the film with regards to the Production Code follows. Film and disc credits pad the hefty insert. A valuable addition, all in all. 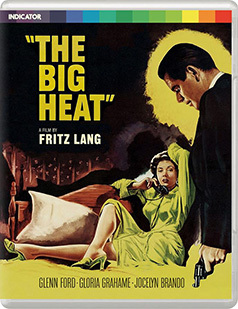 The Big Heat is often recognized as one of Fritz Lang's best American films, at the very least, and also one of the key pictures in the film noir cycle. Like much of Lang's Hollywood output, its exceptional pacing and strength of storytelling entice multiple viewings. There's something, too, about the intense degree of vengeance the film's protagonist gets away with here. 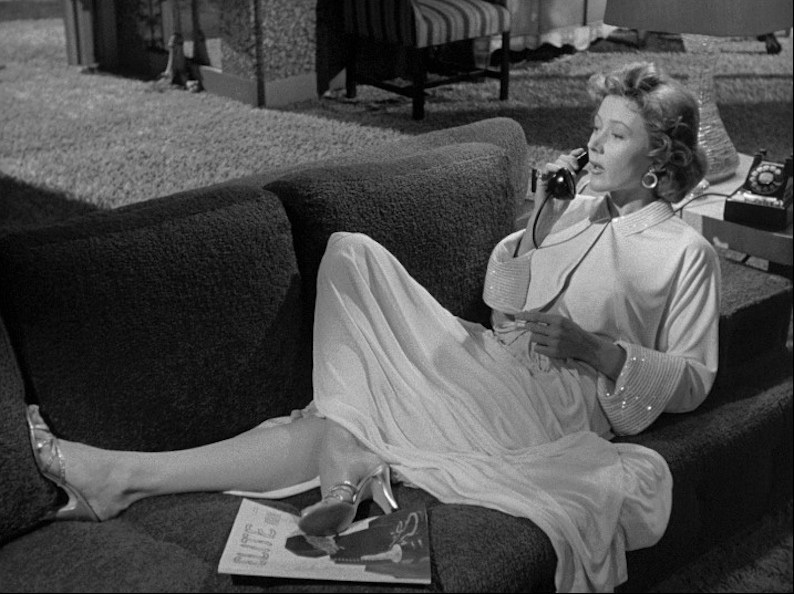 Glenn Ford was never better, even if Gloria Grahame deftly steals the picture from him by the end. It was also Lee Marvin's breakout role and he's hard to shake. Those who previously bought either of the Twilight Time editions may have felt a bit unsatisfied. This Indicator limited edition would then be the cure.